Another favourite walk of our guests at Rickwood B&B in Portpatrick is through Dunskey Glen to join the Southern Upland Way along the coast back to Portpatrick. The length of the circuit is about 4 miles. 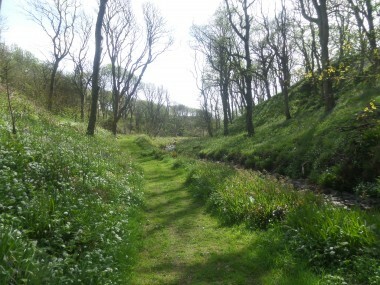 The walk incorporates easy woodland, beach and cliff top paths with plenty opportunities to pause and admire the views. A visit to Dunskey Gardens or a coffee stop at the Seasons Tea Room – this would add a bit to the distance. If you prefer, if tine permits, we would be delighted to drop you off at Dunskey Gardens to shorten the walk a bit! From Rickwood, go along Heugh Road to the war memorial and just after the bus stop, go left. 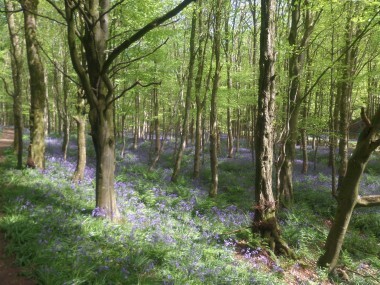 After about 50 paces, follow the sign posted footpath to the right through woodland which, in late spring, is surrounded by a sea of bluebells. The path forks when some cottages come into sight -go right and right again onto an unsealed single track road. When a junction is reached, go left to reach Dunskey Home Farm with its unusual clock tower. Near the far end of the farmyard, go left on another unsealed single track road. Continue for about half a mile then turn left at a sign. Descend this narrow path and soon a delightful stone bridge is reached with a waterfall below it. Cross the bridge where the path runs for a short beside a wooden fence. Look behind you for great views of the bridge and waterfall.When the fence ends, don`t take the left fork -go straight ahead then right. Descend a short distance then the path doubles back to the left across a small wooden bridge and down again to a another pair of wooden bridges Continue to right beside the stream. Walk beside the stream to reach the sea! Eventually the path widens and emerges at Laird`s Bay beside the former coastal interpretation hut. The old wooden pole on your right marks the spot where the first telephone cable between Scotland and Ireland was laid. The project was stated in 1851 and cost £13,000! Here you join the Southern Upland Way via Sandeel Bay where you may just be lucky enough to spot a seal or two. Ascend the path to cliff top to walk beside Dunskey Golf Course back to Portpatrick taking time to look at North Witch Rock along the way.